Rosemary is a member of the mint family and has a rich aromatic smell. It is an evergreen plant and its oil is extracted from the flowering tips of the plant. This oil is used in aromatherapy and has lots of health benefits. It is also good for your hair and the skin. Rosemary oil is a rich source of antioxidants and this helps in slowing down the process of ageing. Applying this oil on the skin helps in making the sagging skin tight and maintains the elasticity of the skin, thus making your skin firmer. It also activates cell growth and decreases the appearance of wrinkles and fine lines on the skin. Rosemary oil has medicinal properties and this helps in treating chronic conditions of the skin like eczema, dermatitis and psoriasis. It is also beneficial for reducing puffiness and swelling of the skin and also for healing burns. This is because it has anti-inflammatory properties. Massaging your skin with rosemary oil keeps the skin hydrated and also tones up the skin. It is good for getting rid of wrinkles and bags on the skin and keeps your skin healthy and retains the elasticity of the skin. It also accelerates the repair and replacement of damaged tissues, thus lightening the scars and the spots on the skin. The antiseptic and antibacterial properties of this oil make it ideal for treating acne and oily skin. On massaging you’re your face with this oil, your complexion is improved and the skin becomes clear, without any dark spots or blemishes. Rosemary oil with used along with carrier oil is good for your hair and make your hair healthy and strong. Other than making your hairs grow strong and long, this oil also helps in making your hair darker. So, you can use this oil instead using hair dyes that are full of chemicals. If you see strands of grey hair, apply rosemary oil and massage well, and it will gradually turn your grey hair dark, without causing any side effects. You can make your hair soft and manageable by using rosemary oil on your hair regularly. So, it is also a good conditioner. Rosemary oil when applied on your scalp helps in stimulating the hair follicles and this makes your hair grow strong and long. This oil improves cell division and makes the blood vessels dilate, thus enabling the follicles to produce new hair. Dry and flaky scalp is best treated by applying rosemary oil. It also prevents premature baldness. Massage your scalp regularly with this oil and it will keep your scalp hydrated, removing the dandruff. To get best results, mix this oil with tea tree oil or basil oil. Rosemary essential oil improves the functioning of antioxidants and helps the body to fight against infections and diseases. You can massage your body with this oil or inhale it. This will lower the level of cortisol in the body, thus helping in destroying the activities of free radicals in the body. This oil is used in aromatherapy to make the immune system strong and to fight against diseases caused by free radicals like cancer and heart diseases. The anti-bacterial and astringent properties of rosemary oil make it excellent for your teeth and the gums. It is good for various dental problems like building up of plaque, bad breath, gingivitis and cavities in the tooth. It is also used as a mouthwash and keeps your teeth and the gums healthy. Rosemary oil is very beneficial for getting relief from headaches, muscular pain, arthritis, rheumatism and other such pains. Because of its anti-inflammatory properties, it is good for sprains and aches in the joints. Just massage the affected area with this oil and you will get relief. By increasing blood circulation, it reduces pain and also helps in healing wounds fast by helping in the coagulation of wounds. Using it as massage oil or adding it to the bathing water provides you relief from different pains in the body. It has diuretic properties also. Rosemary oil is great for increasing your concentration and allows you to focus more on anything that you do. It is also good for increasing your memory power and mental awareness. Students often use it during their exam times to increase their concentration and memory. It also enhances your mood and therefore an excellent remedy for anxiety, depression, fatigue, forgetfulness and tension. By inhaling this oil, your brain becomes fresh and lively and all tiredness is wiped away. Studies have shown that this oil is good for those who are suffering from Alzheimer’s disease. Inhaling this oil slows down the risk of this disease as it stimulates your nerves and acts as a tonic your brain and the nerves. The aromatic smell of rosemary oil provides you relief from throat congestion, cold, sore throat, flu and allergies. Being antiseptic in nature, it is good for treating respiratory infections. The antispasmodic property of this oil makes it beneficial for the treatment of bronchial asthma. It is also good for various other problems like menstrual disorders, indigestion, flatulence and so on. It keeps your liver healthy. It should be used as massage oil or added in baths. You must not consume this oil as it may cause vomiting. 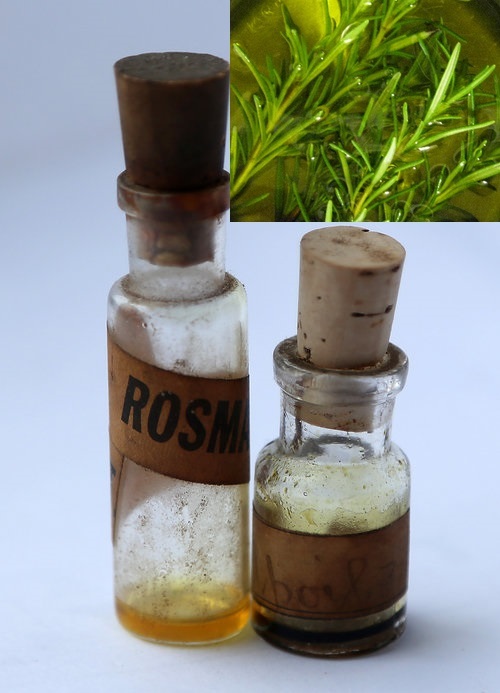 Rosemary essential oil has lots of benefits, but you must use it with care and caution. It is advised not to use this oil during pregnancy, epilepsy or hypertension. If you have any doubt, you may consult a doctor before you use the oil. Rosemary is an excellent anti-dandruff remedy. It’s ability to moisturize the scalp and normalize the PH makes it a powerful anti-dandruff oil. However I would suggest the while suffering from acute dandruff or dry scalp it is always better to use a shampoo first, get some respite from the continuous itching and then go back to applying natural remedies as a long term strategy.